Mature bean plants do best in sunny conditions with a well drained soil. Bean seeds also require a couple of basic conditions to start the germination process--primarily warm temperatures and water. A minimum soil temperature of 60 degrees is ideal, and a range of 60 to 85 degrees is optimum, according to the Alabama Cooperative Extension System. Soil temperature is measured at a depth of 3 to 4 inches. A seed may look plain and featureless, but buried inside is the future of the entire plant. The outer seed coat protects the interior embryo. The embryo contains the epicotyl (the embryonic stems and leaves), the radicle (which develops into the root), a hypocotyl (which connects the cotyledon to the radicle) and the cotyledons (the seed leaves). Beans are dicots, meaning they have two cotyledons. Monocots have only a single cotyledon. The embryo is surrounded by the endosperm, the nutrition inside the seed that will feed the seed's early changes. Washington State University advises that larger seeds can be planted deeper because they have a greater amount of endosperm to feed the plant’s growth, providing the added energy needed to reach the surface. Once at the surface, photosynthesis supplies the energy. Exposed to water, the seed begins to absorb the water. This activates an enzyme that signals cells to multiply. According to the National Gardening Association, botanists are still not sure whether the cells of the seed divide or expand to produce the early growth. 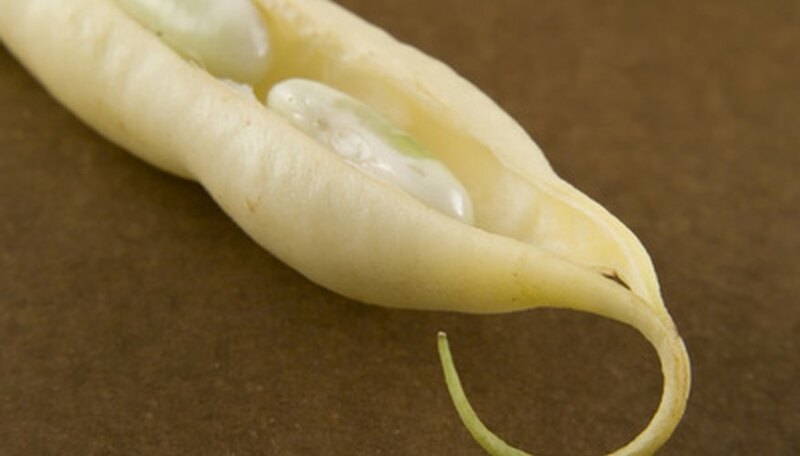 The root--or radicle--breaks through the seed coat first as the embryonic features grow. It begins to take up water and nutrients to continue the process. It also holds the seed in place in the soil. As the roots develop, the “neck” of the hypocotyl arch emerges from the soil. This curve straightens, and the seedling stands and continues to grow upward, seeking sunlight. The cotyledons are exposed to light and begin to open. The cotyledons act to shelter the sensitive true leaves during the period where the plant pushes through the soil. As the stem grows, the true leaves emerge from the protection of the cotyledons, signaling the end of germination. Finally, the cotyledons drop away. In beans, the cotyledons also turn green and use photosynthesis to help feed the emerging plant.